This undated file photo distributed on Sept. 3, 2017, by the North Korean government, shows North Korean leader Kim Jong Un, second from right, at an undisclosed location in North Korea. Foreign journalists will journey into the mountains of North Korea this week to observe the closing of the country’s nuclear test site, a display of goodwill ahead of leader Kim Jong Un’s planned summit with President Donald Trump. TOKYO — Foreign journalists will be allowed to journey deep into the mountains of North Korea this week to observe the closing of the country’s Punggye-ri nuclear test site in a much-touted display of goodwill before leader Kim Jong Un’s planned summit with President Donald Trump next month. Expect good imagery, but not much else. The public display of the closure of the facility on Mount Mantap will likely be heavy on spectacle and light on substance. And the media will be spending much of their time in an unrelated tourism zone that North Korea hopes will be the next big thing for its economy if Kim’s diplomatic overtures pay off in the months ahead. For sure, the closure is a milestone, marking an end to the world’s last active underground testing site and offering some important insights into Kim’s mindset as he sets the stage for his meeting with Trump. Kim announced his plan to close the test site during a gathering of senior party leaders last month, just ahead of his summit with South Korean President Moon Jae-in. His explanation to the party was that North Korea’s nuclear development is now complete and further underground testing is unnecessary. North Korea has conducted six underground nuclear tests since 2006. Its most recent and most powerful explosion, which the North claims tested a hydrogen bomb, was in September. All of its tests have been carried out at Punggye-ri, in the country’s mountainous northeast interior. Before Kim’s announcement, North Korea was the only country that still conducted underground tests. 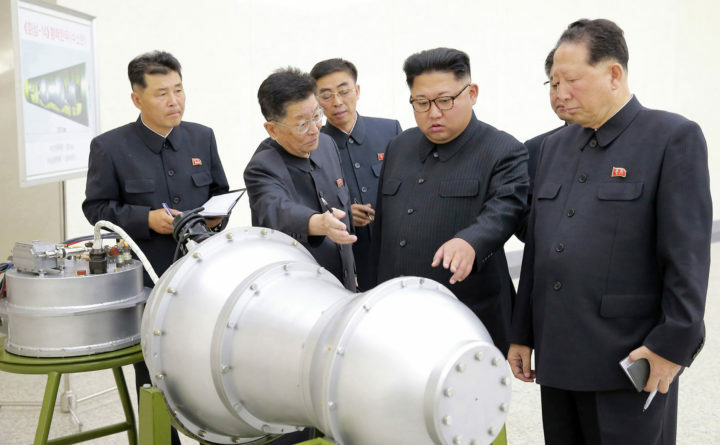 Kim’s claim that such tests are no longer needed may have an element of bravado to it. While the North has demonstrated beyond a doubt that it can produce viable, high-yield nuclear weapons, many experts believe it could still benefit considerably by conducting more tests. “North Korea certainly would need more tests to have any confidence in its H-bomb,” said physicist David Wright, co-director of the global security program of the Union of Concerned Scientists. Wright said the North’s most recent test is a prime example. He believes it was a “demonstration-of-principle device” that was not designed to be small or light enough to be delivered by missile. “The bottom line is that stopping testing is important to limit its ability to build reliable, deliverable warheads — especially for an H-bomb,” he said. So in that sense, Kim is making a significant concession. And if Kim were to switch gears and decide to test again, he would almost certainly be caught. It’s hard to hide a high-powered nuclear blast. Compliance is verifiable. Adam Mount, a senior fellow with the Federation of American Scientists, believes that by inviting international media instead of international monitors, North Korea has “stepped back from a principle of verification.” Journalists do not have the technical expertise, the time spent on site or the equipment necessary to properly analyze and assess the process. “When the United States did not hold Pyongyang to this standard, it lost the first public quarrel over verification,” he said. The site’s closure will take place sometime between Wednesday and Friday, depending on the weather. North Korea’s Foreign Ministry has invited journalists from China, Russia, the United States, the United Kingdom and South Korea to fly on a charter aircraft from Beijing for what it is calling a “ceremony” marking the event. How much of it the journalists, including an Associated Press Television crew, will be able to see is an open question. They will be put up at a hotel in faraway Wonsan, where the press center will be located, and make what promises to be a lengthy trip to the nuclear site by special train. It’s unclear how long they will be allowed to stay at the site. It’s the center of a tourism zone the North has been pouring money into and is trying hard to promote. The media will fly into its shiny new airport and stay at one of its opulent new tourist hotels. If not actually bused there, they will undoubtedly be reminded that Masik Pass, the North’s luxury ski resort, and scenic Mount Kumgang, which just a decade ago was open to South Korean tourists, are just a short drive away. With international talks to dismantle its nuclear program underway in 2008, North Korea called in the foreign media to film the demolition of a 66-foot-tall cooling tower at its Yongbyon nuclear reactor. The move prompted Washington to take North Korea off its list of state sponsors of terrorism and lift some sanctions. The North’s declaration that it will end its underground testing and close the Punggye-ri site could just as well be interpreted as a move to bolster Kim’s claim that his country is now a responsible nuclear power and appease the concerns of its neighbor and economic lifeline, China.